Fiyaz Mughal founded the Tell MAMA national anti-Muslim monitoring project. Founded in 2011, he set up and developed the working structures, partnerships and public relations of the organisation, whilst ensuring that anti-Muslim hatred was measured and monitored and victims of hate supported in the process. This at a time of press skepticism about the scale of anti-Muslim hatred and when there was no mechanism to monitor and measure it. Against many barriers, the Tell MAMA project has become the leading project supporting victims of anti-Muslim hatred and Islamophobia across the country. Mughal also ensured that regional advisory groups and a national advisory group was set up for Tell MAMA, as well as over 15 police partnerships were developed to ensure a better journey with outcomes for people reporting in. He became a speaker on anti-Muslim hatred at a national level and was instrumental in reaching out to and developing key partnerships with other hate crime organisations such as the Community Security Trust and GALOP. 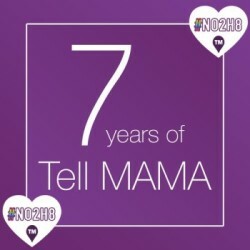 He also ensured that the voice of LGBT Muslims, as well as other minorities within Muslim communities were represented and supported within Tell MAMA. Mughal also spoke on numerous occasions at the Organisation for Security and Co-operation in Europe (OSCE), and in numerous European countries who were interested in setting up a similar service to Tell MAMA. He also was consulted with by numerous organisations who wanted to support victims of anti-Muslim hate or Islamophobia in their respective countries. Mughal’s advocacy work on highlighting anti-Muslim hate also meant challenging major social media corporations, including Twitter and Facebook, when they failed to remove illegal or hate material against communities. He has spoken at the Home Affairs Select Committee and advised numerous senior civil servants and ministers on the state of anti-Muslim hate and the respective triggers. Mughal’s work has placed anti-Muslim hate crime monitoring on the map and his advocacy on this area has meant that policy makers and shapers have sought his expertise where possible. He also has been the founder of the National No2H8 Awards that has gone from strength to strength and which has brought hate crime agencies together to honour those tackling hatred, prejudice and intolerance at grass-roots levels.